A country’s power of innovation and technology is linked to its cultural and social background. As competition becomes global it is more and more important to focus on the biggest strengths to survive in a connected world market. The average SWOT and 5C analysis will bring you only so far, and will most likely keep you in the Red Ocean. So the question is how to position yourself and play your cards right. Look at industrialized nations from the dimensions of masculine and feminine, juvenile and adult. Morinosuke Kawaguchi applies these dimensions to segment mentalities, values, technologies and products, and in his lectures he shows how consumers, automobiles, vacuum cleaners and even logos can be studied using his matrix. Within these parameters Japan’s strength lies in the girly, emotional, and childish. The diametrical opposite is the rational, adult male. 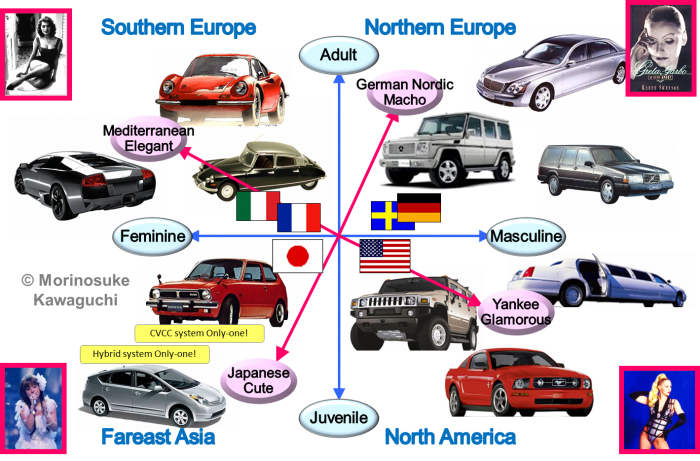 This is not to say that one quadrant is better than the other, or that Japan doesn’t have products that match the tastes of the adult, rational male. But to compete with the Nordic mentality, Japanese are bound to lose – or spend too much resource on keeping up. According to Kawaguchi, a country may be advised to focus on making products that don’t stray too far away from its home turf. The best example of Japan’s power of manufacturing is the Japanese toilet, which symbolizes the power of manufacturing based on true Japanese sensibilities. To learn more about this, please watch Morinosuke Kawaguchi’s TEDxTokyo Toilet Talk: here. You can even apply Morinosuke Kawaguchi’s chart to find your own strength, your target audience and your product’s appeal.